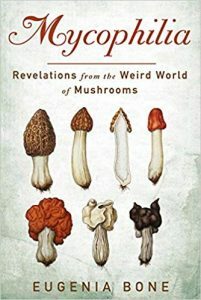 A review of Mycophilia: Revelations from the Weird World of Mushrooms, by Eugenia Bone. Review by Kim Bannerman As dusk settled over the woods, I spotted the thing through a break in the trees, where the underbrush was thinnest. Imagine, if you will, a floppy-frilly brain, about the same size and shape as head … Continue reading "Christmas Countdown Day 15"